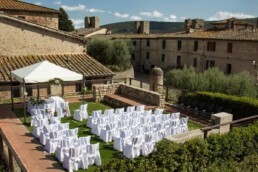 Monteriggioni has a wide range of wedding locations and solutions. As well as important historical buildings, there are also several pretty gardens within the town’s ancient walls. Choose between medieval Monteriggioni Castle and the unique charm of the ancient Ospitale building in Abbadia a Isola, a must for pilgrims and travelers making their way along the Tuscan part of the Via Francigena. 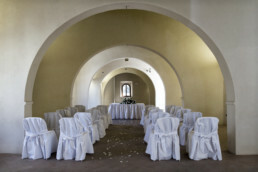 Couples can exchange vows in a civil wedding ceremony within the castle walls in the Sala Dante Alighieri. This elegant and refined ceremonial room inside the historical building has recently been restored to its full medieval glory. The walls are decorated with frescoes that depict Dante Alighieri and other historical figures, painted by the artist Tommaso Andreini. After the ceremony, the bride and groom can raise a glass with their guests in one of the castle gardens. There are several green spaces to get married within the castle walls. The D. Calosi Gardens (see photo) in piazzetta Fontebranda next to the ancient castle walls provide plenty of space for up to 35 guests. The smaller Giardino sotto alle mura can accommodate up to 25 people and is an evocative green space for more intimate gatherings. The public gardens in Via del Tricolore is a larger open space for ceremonies involving more than 80 guests. 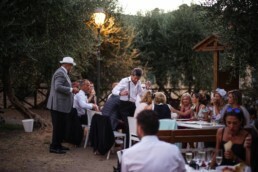 It boasts a lovely lawn surrounded by olive trees, and includes a seating area with tables and chairs. 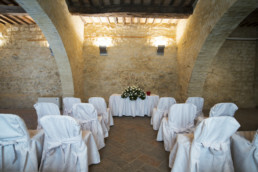 This ancient monastery on the via Francigena pilgrims’ way is managed by the local authorities in nearby Monteriggioni and provides a splendid setting for smaller wedding parties. 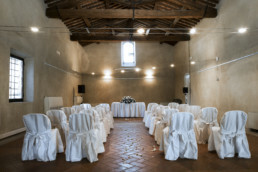 The Sala della Tinaia is on the ground floor and features two large painted brickwork vats on one side, evidence of how these rooms were once used by the local farming community. 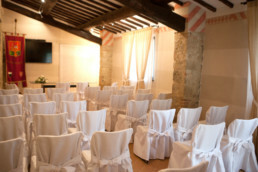 This beautiful room can seat up to 35 wedding guests. The Sala Sigerico is on the first floor of the building and has a wonderful view of the church and the remains of the ancient cloister. This room can seat larger parties of up to 60 guests.